Discover all our universes in our latest store located close to the Museum of the gendarmerie and the Hotel de Paris, in Saint-Tropez, mythical village of the Mediterranean coast. 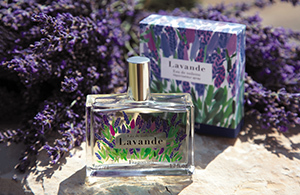 The generous scent of lavender has been transformed into a limited edition line of perfumes. Fragonard has envisioned a Lavande for 2019 of scintillating harmonies, woven with blue-toned ribbons of azure, indigo, and purple. These are the nuances of colour that we find in lavender fields at the various hours of a summer day. You will find its delicate scent across the entire line!